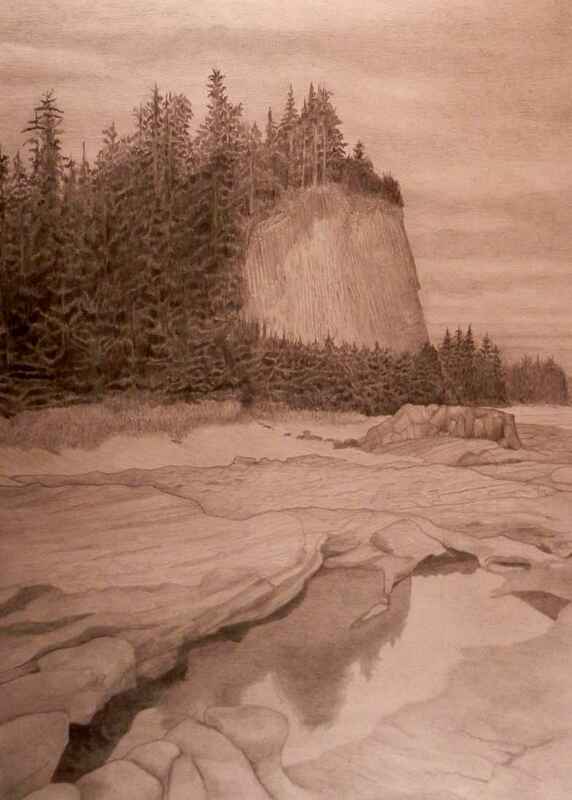 This is a low resolution digital photograph of a large format pencil drawing. It is a view of Tow Hill, east of Masset on the north shore of Haida Gwaii. This spectacular volcanic feature dominates the landscape for miles around, and from its summit you can see the coast of Alaska 50 miles away to the north. It and the twisted lava flows on the shoreline below form the "anchor" for the sandy Rose Spit that divides Dixon Entrance from Hecate Strait, two of the wildest ocean passages on earth. In this photograph the drawing is not yet complete, shading and highlighting is ongoing.